I’ve more or less completed by reading of Genesis and Mark’s Gospel which began on 01/01/2015 and can be accessed from my archive. Today there are some thoughts on Mark before I start a new project. Here are some largely unsupported assertions about Mark’s Gospel, the evidence for which can be found in the series just completed. 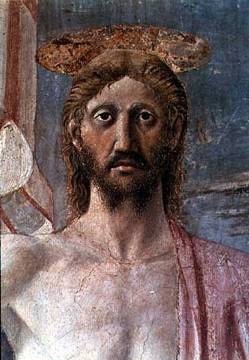 The images of Jesus are from top to bottom by Rembrandt, Della Francesca, and Caravaggio. 1. Mark presents the story of Jesus as the story of the crucified and risen son of God. That may seem uncontroversial, but I mean that from the start of the Gospel, in all its incidents, and at its end, Jesus is always the crucied and risen son. In a typical Markan incident, Jesus places himself in the place of danger, exclusion or death, in order to raise people to new life. At its simplest, his hand touches the body of a leper in order to heal him. His whole ministry is the service of God offered by God’s crucified and risen son. 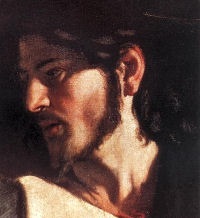 Doubtless Mark believed that Jesus was alive with God, but he meant his readers to know that a disciple will find him in Galilee, that is, in his continuing ministry as the crucified and risen son of God. Yes, I am saying that Mark’s gospel is circular in structure, because of what Mark wants his readers to know about faith in Jesus. 3. Mark tells no stories about the appearances of the risen one, because he wants disciples to know that Jesus’ real presence is in his ministry as continued by them in the world. In that ministry that crucified and risen Jesus the son of God will be ever present. 4. The ministry of Jesus is presented as a frontal assault by God on the powers of evil and death in the world. These are not mythical entities, but religious, cultural and political powers of destruction. They are real, historic powers capable of real harm. Therefore the one who fights them has to be prepared for real suffering (crucifixion) and can only win if he/she brings God’s life ( resurrection) into the battle. The story of Jairus’ daughter is a paradigm of the whole ministry of Jesus. He is invited to help a dying girl. When he arrives the girl is apparently dead. Inviting ridicule Jesus goes into the place of death, touches the dead girl, and says, “time to get up, little dove,” and she awakens. This is the ministry of the cruciified and risen son of God: to go to the people threatened by evil and death, making one body with them, and issuing his wake up call. 5 . Is Mark turning the ministry of Jesus into a myth? Not at all. he is rescuing the story of Jesus from being a personal or communal myth of salvation, and restoring it to the dust of the streets. 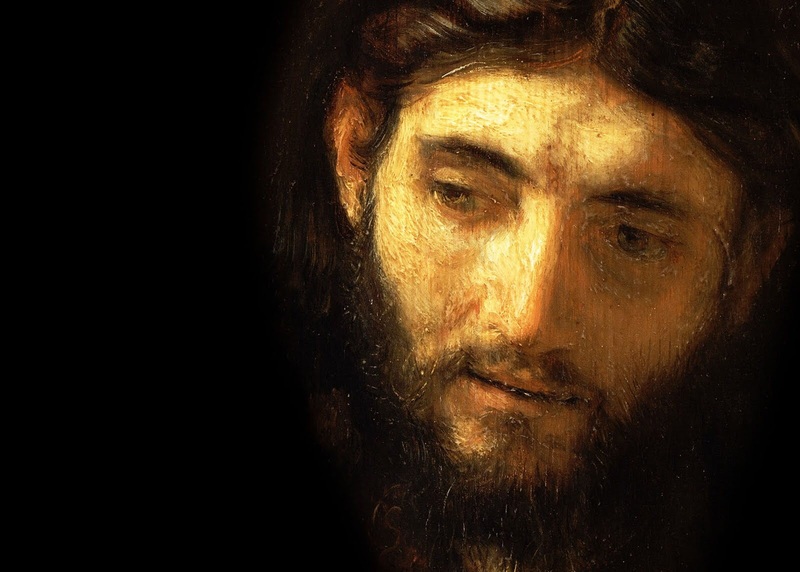 We cannot tell how true Mark has been to his sources of information about Jesus. But we can say that his evident purpose is to make the once and forever earthly ministry of the crucified and risen son of God, the central reality of the Christian life. Tremendous summary of Mark! Concise and completely to the essence of Mark. I agree as to the ‘circular’ motion/structure of Mark. That is clearly why he didn’t include any resurrection appearances, and why the longer endings added later are so clearly out of step and introduce a mythological element that is clearly contrary to Mark’s very unmythological approach. And yes, the frontal assault on the powers and principalities! Discipleship to confront the powers. That’s the circular intent and the command to go to Galilee! Brilliant connection you make in this summary. I’m sure you’re familiar with Ched Meyers’ Binding the Strong Man (on Mark’s Gospel) and the Walter Wink trilogy on the powers! I haven’t read all your Mark posts (not even close) but I will go into your Archive and read your comments on select passages having to do with the Son of Man terminology. Mike, you are an insightful commentator and I truly believe that you are closer to the heart of scripture’s intent than anyone else in my personal experience. You are serious, scholarly, but withou ever losing the existential call to discipleship – true discipleship, not the discipleship of “cheap grace” that Bonhoeffer exposed! I am so glad I have the opportunity to read your reflections, and I thank God that you are devoting significant time to this blog. May God continue to draw you to Galilee! Kostas, you do me too much honour. But it’s sweet because your own blogs are so truthful. In fact, it’s good to have company in reading the Scripture as it asks to be read: with all our heart and soul and mind and strength. The mistake of those who do this are preferable to the occasional rightness of those who don’t.